Eye infections are extremely common and there is more than one type with several different causes and a range of different symptoms. Infections can be caused by viruses, allergies or bacteria and can affect people of any age in either one eye or both at the same time. Conjunctivitis: Also known as pink eye, this eye infection is highly contagious. It cause the eye to become red and irritated. It is usually caused by a virus but can also be caused by bacteria or allergens. Sty: Also known as a hordeolum, a stye is caused by bacteria beneath the surface of the skin. A sty is characterized by a small lump on a person’s eyelid or beneath the eyelash. Styes can be painful and itchy. Blepharitis: Is an eye condition that occurs when the oil glands at the base of your eyelashes get clogged. It can result in intense irritation and a burning sensation or a feeling that something is stuck in the eye. Keratitis: Causes the cornea to swell and inflame. It is usually caused by some form of microbe including viruses, bacteria and fungi but can also be caused by a foreign body. Orbital Cellulitis: Is a bacterial infection where the tissues surrounding the eyes get infected. This is a dangerous condition and not one to take lightly so seek medical advice if you suspect you may have this condition. Most of the time, an eye infection is not serious and is easily treated. If you are concerned, it is important to seek medical advice to make sure that the condition is not a serious one that may lead to further damage. There are also plenty of safe and natural not to mention very effective remedies that you can try at home to clear up your infection fast. The following list includes what we think are the most effective home remedies. Boric acid has mild antibacterial and also anti-fungal properties which can help treat your eye infection and soothe pain and irritation. It is able to deal with many of the symptoms including itching, tearing and redness. It may cause a slight sting when applied but the feeling should quickly pass. Mix 1/8th of a teaspoon of boric acid into a cup of distilled water. Bring this solution to the boil, remove from the heat and wait for it to cool. Use the finished solution to wash your eyes. Repeat 2 or 3 times a day but use a fresh wash each time. Green tea is very good for your health in general but you can also use it to clear up an eye infection and soothe the irritation or pain in your eyes. Green tea is full of tannic acid which can help treat the infection and reduce inflammation. It is also home to numerous powerful antioxidant which can help your eye health in general. Put 2 green tea bags into a cup of hot water and allow them to soak for a minute or two. Remove them from the cup and squeeze out any excess liquid. Pop them in your refrigerator to cool down. When they are cold but still moist, place them onto your eyes for around ten minutes. Repeat several times a day until the infection and the symptoms have cleared up. All honey is antimicrobial in nature but there are some that are stronger than others. Manuka honey may be more expensive but is especially powerful when it comes to destroying harmful bacteria. Mix your honey with an equal amount of clean, distilled water. Dip a cotton ball in the solution and use it to clean around the eye. Repeat the process several times daily until your condition has improved. Applying heat to your eye with a soothing warm compress improves blood circulation and can help relieve irritation and pain while also preventing the infection from spreading. It is an especially effective remedy for styes but can be used to treat most types of infection. Dip a towel or cloth into a bowl of hot water then wring out any excess liquid. Hold the towel against your eye for about 5 minutes. Clean the eyes with a cloth. Repeat the treatment several times daily until the infection has gone but remember to use a separate towel if you are treating both eyes. Chamomile has antimicrobial and anti-inflammatory properties that are extremely effective for treating red eye and other types of infection. It can also reduce swelling, itching and redness. Add a teaspoon of chamomile flowers to one cup of boiled water and allow to steep for at least 5 minutes. Use the solution to wash the inside and outer parts of your eye. Alternatively, soak some tea bags in boiled water then put them in your refrigerator to cool. You can place the tea bags on your eyes to help ease the inflammation. One of the easiest ways to treat an eye infection is to make your own saline solution. This is especially helpful for treating swollen, itchy and irritated eyes. The saline solution can help treat your infection as well as washing out any debris in your eyes. Mix a teaspoon of sea salt or table salt in a cup of distilled water. Boil up the solution and allow to cool. Use a cotton ball to wash your eye with the solution. Colloidal silver is becoming more and more popular as an alternative treatment for a wide range of conditions and can also be used to treat infections of the eyes. The minute silver particles contained in the solution help attract infected cells which then get transported into the blood stream where they are eliminated. Use the remedy twice daily for as long as necessary. Colloidal silver ointment is also available. This can be rubbed around your eyes to ease irritation and swelling. Apple cider vinegar is considered by some to be an especially effective natural treatment for pink eye or conjunctivitis. It contains microbial properties within the malic acid that are effective in treating bacterial infections. It can also help clear the eyes of foreign bodies and debris. Mix a teaspoon of organic apple cider vinegar into one glass of distilled water. Take a cotton ball and dip it in the vinegar. Use the ball to gently wash around the infected eye. Flaxseed is very rich in healthy omega-3 fatty acid known to help fight infection and boost immunity. 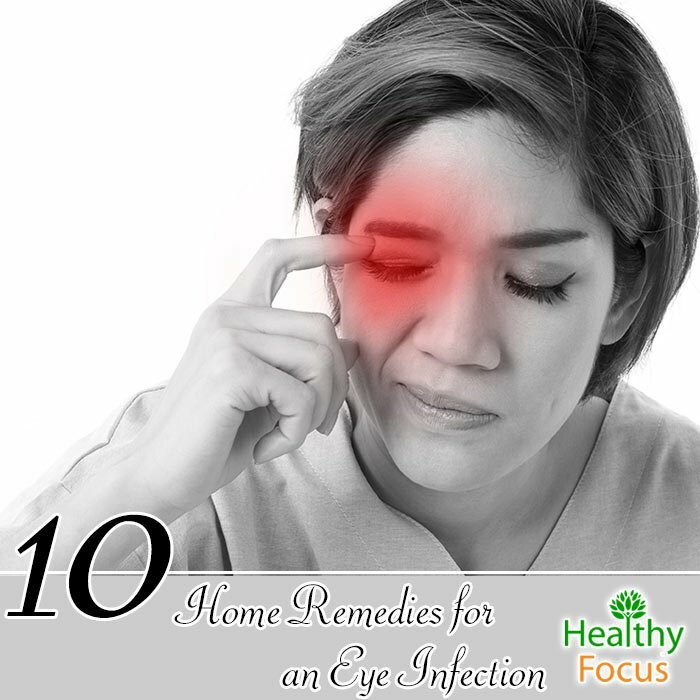 They are also an effective natural, home remedy for your eye infection. Boil half a cup of water and then add one ounce of flaxseed. Let the seeds steep for around 20 minutes. Strain the water and put your warm flaxseed on a washcloth or piece of cotton. Apply the cloth to your eye and hold it in place for several minutes. Repeat the treatment several times daily. Baby shampoo is another excellent home treatment for an eyes infection. Make sure that you use mild, tearless type of baby shampoo. Dilute a small amount of shampoo with water. Use a cotton ball to apply the mixture to your affected eyes. Wash out your eyes gently with baby shampoo several times a week to keep them infection free and clean of debris.